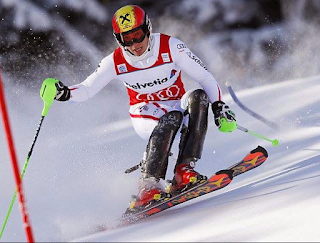 Harald Harb, President of Harb Ski Systems, posts his thoughts on skiing, ski racing, technique and more. Keeping up your skiing year after year! 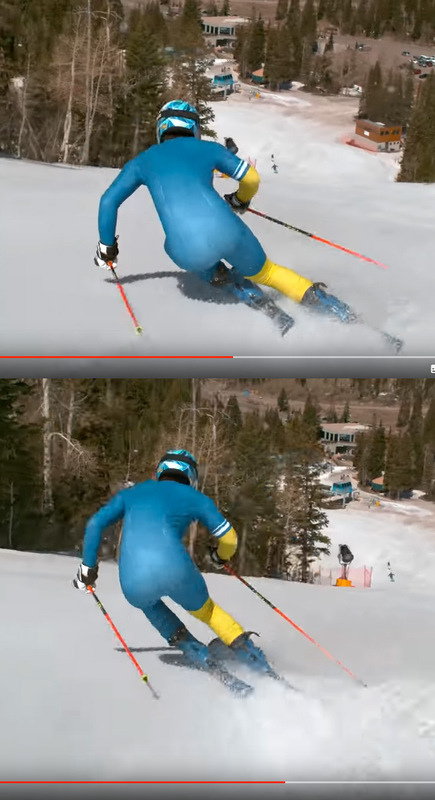 Comparing my skiing from one year to the next gives me an idea if it is still on the right track. Victor Muffet Jeandet shows Harb Techniques! If you are still coaching or teaching PSIA extension or pushing off or a wide stance with pivoting, you had better look at what is really happening on the world cup by the best. PMTS Direct Parallel has been documented in books, videos, and DVDs for 22 years. PMTS is the coaching of Harb Systems. Here it is demonstrated by one of the top world cup skiers in his freeskiing. In the photos above Victor Muffet-Jeandet increases his counteracting and counterbalance. Below notice the release of the big toe edge ski first! This is demonstrated by an "O" frame knee position. The above photos show "flexing retraction" and "pull back" of the foot all in two photos. Jeandet holds his counteracting while releasing his legs and ski angles. Compare the lifting of the stance foot and flexing of that leg. 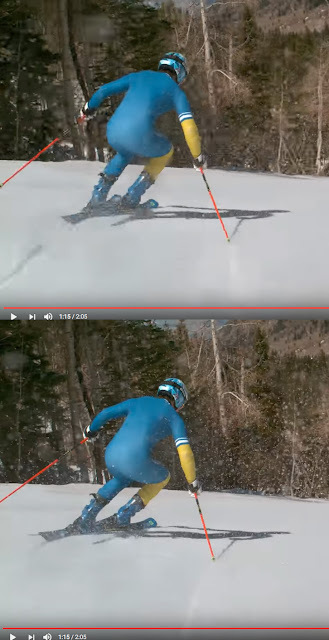 In the below photos the tail of the ski is obviously lifted more than the tip. This confirms that he is pulling the free foot back, which moves the hips forward before he arrives at the falline. No extension is used or necessary. A treatise for skiing at the highest levels. The previous Post (one article below) in which I demonstrate the differences between world cup skiers prompted me to offer a more complete explanation as to what is happening in detail. The best racers have figured this out, the less efficient show more rotation and leaning, without the effective coiling shown by the best. 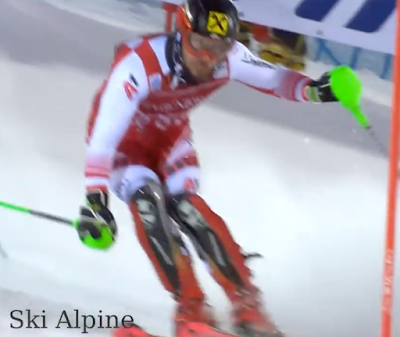 Perfect preparation for a release, Hirscher with a coiled body holds his counteracting until the critical moment. There is an extraordinary reaction in athletic activities due to the response of a muscle to stretching. This reaction exists in all sports where a muscle is stretched beyond its resting length. In certain sports, such as golf and track and field, the reaction is known and exploited, while in skiing the influence of the muscle reaction has not been recognized. When a muscle is stretched beyond its resting length it creates tension within the muscle. When released from its stretch, just like a spring, the muscle will pull back to its original length, without an active effort to contract that muscle. You can use this recoil or release of tension on its own, to create some movement without active effort, or you can use it to augment your effort — after the moment of stretch, the muscle can contract more strongly than without the pre-stretch. In the body, there are many opposing muscle sets in which one can be used to pre-stretch the other. Think, for example, of counterbalancing. If you contract the muscles on the right side of the torso, pulling the right ribs toward the right hip, then the left side of the torso will be stretched. In order to release the tension developed in the left side, one must only relax the right side. If you alternate the counterbalancing movements rhythmically from side to side, then each time that you relax one side, you get the spring effect on the other side of the torso that will start to pull you in the new, desired direction. Hirscher holds his coiled body until he's ready for a transition. Many people who participate in sports never get the sense of body movements that are a reaction; they only sense and perform active, premeditated efforts. In our counterbalancing example above, they might sense the effort to crunch one side then the other, without ever being aware of the “spring back” of the torso that results simply from relaxing or ceasing their efforts. There is a different sense of control between active efforts and reactions. When you release stored energy, you may or may not be able to control the reaction that results once it starts. The key to success is proper preparation. Consider the release from a ski turn: if you are in balance over the skis and ready to tip the feet and counterbalance in the new direction, then an energetic release will create the desirable result of High-C angles. If you are leaning back with your arms and torso rotated, then the energy from release will likely cause you to rotate further and probably fall backwards. This completely undesirable reaction is due to poor preparation prior to release. With correct preparation, you can simply relax one or more parts of the body, let the stored energy take you, and know that you will achieve the desired result. When I developed PMTS technique, I based it in mechanics and dynamics. My premise was that efficient movements that produce the desired results with the skis would create progress and results for all skiers. In the process of developing and teaching the technique, I have found that effective technique not only makes the skis do what you want for one turn, it also prepares the skis and the body to take advantage of the reactions of one turn for performing the next. These reactions include the energetic rebound of ski equipment and the release of stored energy in muscles under tension. Effective technique produces the desired results in one turn, the reactions that help with linking turns, and the preparedness to unleash these reactions without having to consciously control their outcome. If you are trying to push your body from one arc to the next, you will never experience skiing as it is intended. 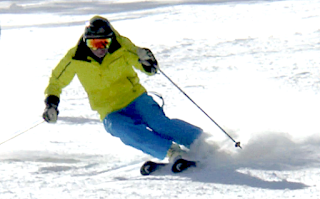 Skiers are often taught to push their bodies downhill toward an imaginary point, toward the center of the upcoming arc, or simply up and down the slope. 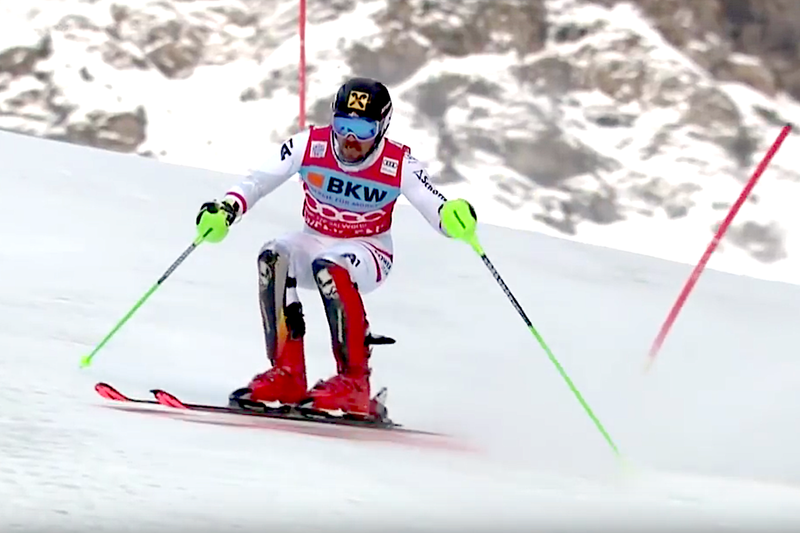 This pushing effort, an extension of the new outside or stance leg, is intended to move the body from one side of the skis to the other, and to create body and edge angles. The deliberate extension requires effort, and it outweighs any rebound or release energy that might be available to assist with the turn transition. Indeed, the turn that results from an energetic extension often lacks the sort of rebound energy that I described above. 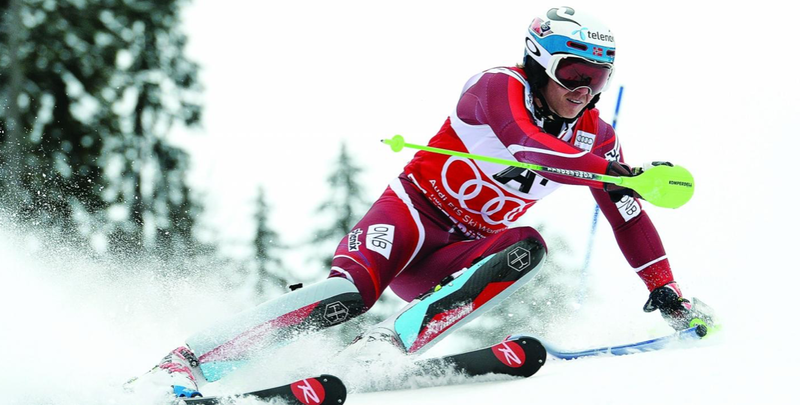 Sometimes, previous athletic experiences and movement familiarity may hold us back from experiencing low-effort, high-performance skiing. Virtually all sports and activities require a “push-off” type movement of the leg. This is what we term a concentric contraction of the quadriceps ( the thigh muscle on the front of the upper leg). In a concentric contraction, the muscle shortens as it is tensed. Starting in the schoolyard with running and jumping, we have trained our legs to extend with contraction of the quadriceps muscle. Continue into soccer, football, basketball (run, cut, and jump); track and field (more running and jumping); ice or inline skating (push off hard to skate faster). All these sports train us to push off the ground by extending the leg, the concentric contraction. — the muscle lengthens while contracted, causing the leg to bend more. Here are examples of each type of contraction. Imagine that you are holding a heavy box that you need to set down on the floor. Holding the box, slowly squat down toward the floor. This is the eccentric contraction of the quadriceps. When you are part way down to the floor in your squat, stop and hold that position for a moment or two — that’s isometric. Then, stand back up, still holding the box. That’s a concentric contraction. 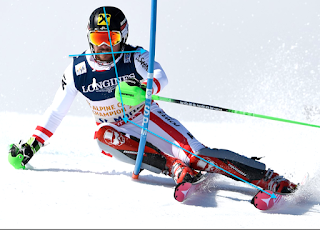 Even though we are most familiar with the concentric contraction, and we train it most often, having strength, balance, and control in isometric and eccentric contractions of the quadriceps will be more important in skiing. The hamstrings will contract to maintain fore/aft balance while the quads are controlling the extension or the flexing of the leg. What does this imply about cross training for alpine skiing? Well, vertical jumps and leg extensions are not the most important movements to practice. 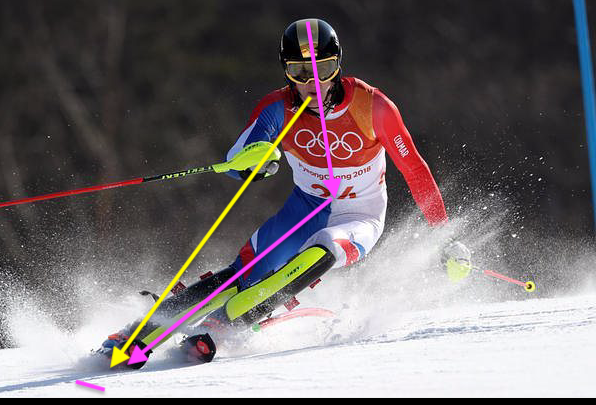 If we list movements of the legs in order of their importance in skiing, tipping the feet would be first, followed by flexing or bending the legs. 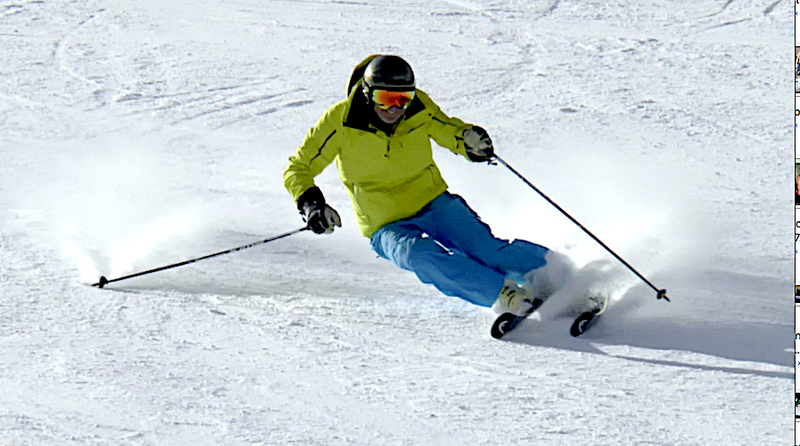 Taking it further we’d go to retracting the legs — an active effort to shorten or bend them, not just a passive relaxation — which is used in quick, short turns in bumps, steeps, and slalom racing. This points to the fact that pulling the feet and legs toward the body is more important in skiing than pushing the body away from the feet. If you tip your skis onto the new edges in the upper part of the arc, before the skis turn or travel downhill, and establish solid balance with counterbalancing and continued tipping, you are starting the new arc correctly. The skis’ sidecut will engage in the snow, with the result being an arc that curves into the fall line. Increase the edge angle by flexing (bending) the inside leg and tipping more while staying in balance and riding the skis through the arc. Extend the outside leg enough the stay in contact with the snow and to prepare for the loads through the middle and bottom of the arc. These movements create a great turn. 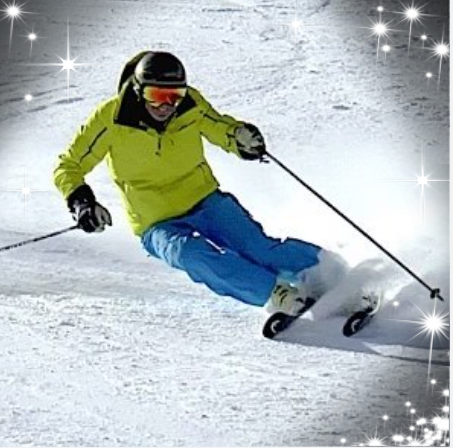 As the arc of the skis brings you back across the hill, relax the outside leg (don’t contract the thigh muscle as hard). When you reduce your resistance to the loads at the bottom of the arc, the outside leg will bend and your body will start to travel downhill, across the skis, and into the new turn arc without any need to push. The motion of the body out of the old arc, into the new arc, is a reaction to relaxing the old stance leg. It’s a result of the proper preparation throughout the arc. With it comes a certain sense of uncoiling and unfolding from the angles of the old turn. It’s often an unsettling sensation for skiers who haven’t felt it before. 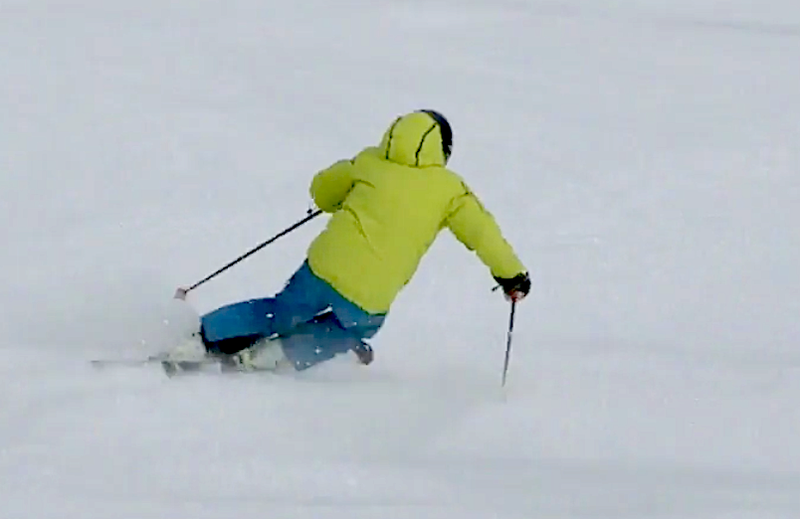 Most skiers and instructors never feel this uncoiling because they prepare for and perform their “release” by extending the new outside leg, pushing themselves out of the old turn. This pushing movement completely ignores the stored energy in the arc of the turn; if there was stored energy in their skis and body from the previous arc, it is dissipated without contributing to the start of the new turn. 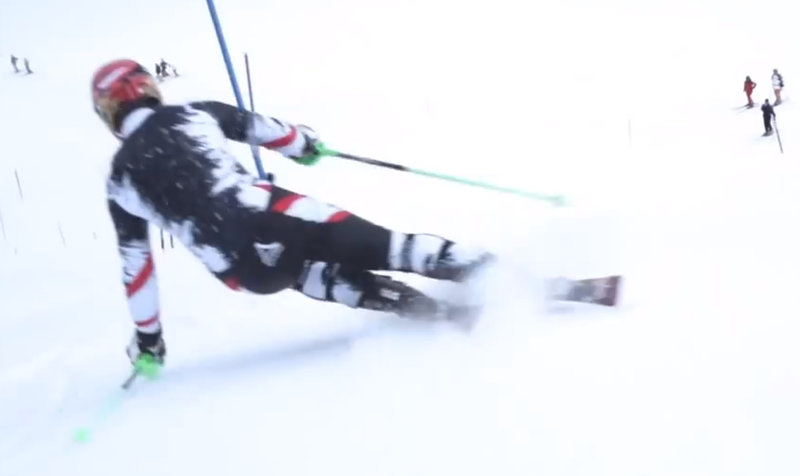 If you ski with correct technique, starting the release by relaxing the legs and allowing the legs to bend, you release the stored tension in the muscles and the rebound of the ski. The energy that you stored in your body and skis through the arc is made available to help with the turn transition. 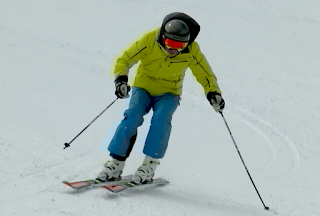 Bending the ski through the turn arc — which is produced by using the leg movements described above — is necessary for creating rebound. Not only will bending the ski tighten the turn arc and assist with speed control, it has the desirable effect of making energy available at the release. Muscles are stretched, creating stored tension, through several efforts of PMTS technique. Counterbalancing stretches one side of the torso while the other side is contracted. Counteracting twists the torso, stretching many muscles. Deep flexing of the inside leg stretches the hamstring and gluteus muscles. Most of the muscles subjected to stretching, and thus the stretch response, are on the free-foot side of the body. If you are skiing with PMTS technique, then you are either performing this stretching already, or you are on the verge of it. Remember that to produce the stretching response, the muscle has to be stretched beyond its relaxed length. So, your range of motion needs to be sufficient to stretch the muscles. If you are counterbalancing, you can’t just tighten the muscles while the torso remains in line with the legs; you have to tilt the torso enough to stretch the muscles on the free-foot side of the torso. You have to make an angle between your torso and your legs. Next, in order to derive a benefit from pre-stretching the muscle, you have to release the stretch and contract those muscles right away after stretching — you cannot wait, or the benefit is lost. What does this mean in skiing? You cannot hesitate at release and still benefit from the pre-stretch. At transition, if you flatten your skis and then pause, gathering the confidence to tip further, then you’ve lost that additional impetus, that boost. Overcoming the hesitation, though it may feel like you are giving up control, will require less effort and will put you in the new arc sooner and faster. When you relax to release from a turn with pre-stretch, at first you might not know what the outcome will be. We can tell you that the result is great, that you’ll go exactly where you want to go, but you’ll develop trust and confidence sooner if you begin on more gradual terrain. To build the correct tension in the free-side muscles using PMTS technique, after the release, tip, engage, keep flexing the inside leg and extending the outside leg. The energy that you build through the arc, both in the bent ski and the stretched muscles, can be “stored” until the time of release, or it can be slowly dissipated through too-early bending of the stance leg, or a late or too-slow release. When you maintain the stored energy until release and then flex to release, your body will start to move across the skis in a beautiful way. If you tip the feet toward the new edges at the same time, you can easily tip all the way to the new edges. This should be performed in a relaxed manner, not rushing or panicking. As the feet are tipping from the old to the new edges, the upper body is tilting from the old to the new direction. This is where pre-stretching helps. At release, as the legs are relaxed, so should be the muscles in the stance side of the torso that were responsible for counterbalancing in the old turn. This releases the stretch in the muscles of the free side, making them momentarily “stronger” as they begin the counterbalancing effort for the new set of edges. You can counterbalance sooner and harder with the benefit of pre-stretch, readying you to balance on the new, High-C edges. The combined results of ski rebound and counterbalancing pre-stretch make for a quicker than usual transition to the new edges. Though this might give you the sense that the hips are leading downhill through the transition, don’t actually push the hips. Once you are on edge, stay balanced and the ski will carve into the High-C part of the new arc. As long as you do not twist or turn the feet, you’ll be fine and you’ll be in control. Keep flexing and tipping to tighten the turn arc. If you have developed proper and sufficient counteracting movements through the arc of the turn, then the pre-stretch of the opposite set of counteracting muscles will give you a stronger turn transition. This is especially helpful on steep terrain and icy snow. 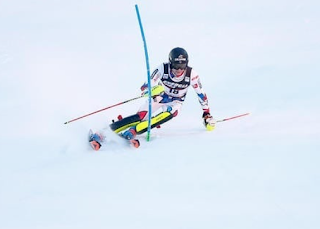 Once tipping angles are established and the skis are gripping on edge, counteracting movements align the skeleton so that the whole body can support the load of resisting momentum through the arc. Counteracting movements coil the upper body, down to the hips and lower back, relative to the lower body. If you counteract hard enough to stretch the opposing set of muscles, then the relaxation at release will unwrap you quickly from the old angles, and give you a head start into the angles and counteracting movements of the new turn. This works in tandem with the counterbalancing movements of the previous section. The result is a quicker transition, and an earlier arrival at balance on and engagement of the new edges. Few show this perfect preparation. 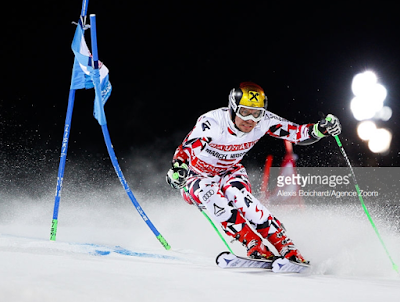 Hirscher uncoiling, relaxing releasing his stance leg from holding to retraction. As I pointed out earlier, we are accustomed to using and feeling strong extension of the legs in many sports and activities. When we bring this familiar activity into skiing, though pushing the body away from the feet may feel strong and forceful, extension at the wrong time diminishes the performance of the skis, makes you lose balance, and overall is simply a waste of effort and energy. When you balance with the skis, rather than pushing away from them, you give the skis a chance to bend and store energy; you get better grip and a tighter radius in the current turn, and an easier transition to the next. Combine this with counterbalancing and counteracting movements that are strong enough to pre-stretch their opposing muscles, and you’ll get quicker and easier turn transitions that you ever thought, simply by relaxing. You’ll have a new elegance and effectiveness in your skiing, with an economy of effort. that’s a great goal for the coming season. October 10, 2006, edited, updated January 2019. Differences in World Cup Slalom between top men. 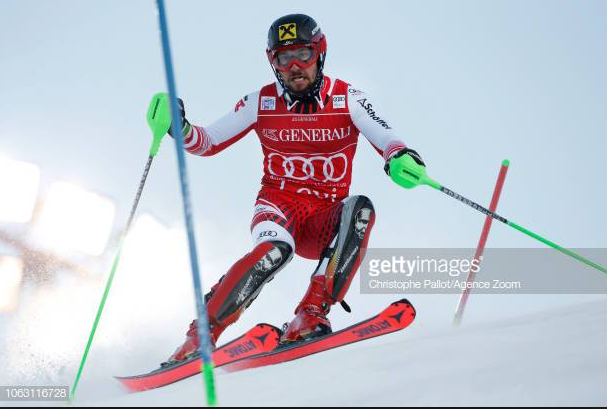 If we look at Marcel Hirscher as the benchmark for technical refinement and prowess here is what is remarkable about his skiing. He counteracts and counterbalances more often and with more upper body flexibility and with more range of motion beyond the rest. The double hand block has numerous advantages, but it has one that most observers rarely point out. It doesn't allow the inside hand to reach for the ground. Too many of the top racers use the inside hand reach as a crutch. 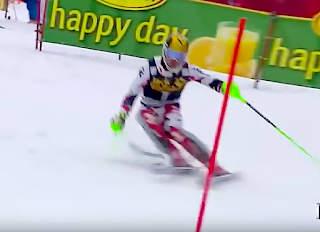 In the Parallel city slalom that Hirscher won, many racers used this double block. If you compare Christoffersen there is more upper body rotation and less counterbalance. Hirscher creates more CA, holds it longer at the point of release than the rest. The new guy "Clement Noel" has most of Hirscher's technical qualities. 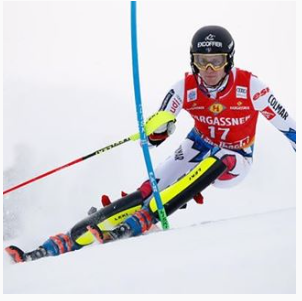 Compare the two, Christoffersen is more stretched out leaning further from his outside ski boot. 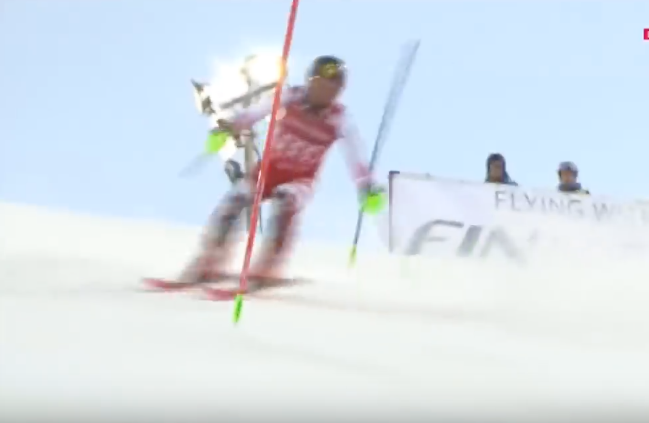 Hirscher's upper body is more verticle and his hip less rotated. It doesn't take much, and the consequences are grave if you don't have enough. Below are extreme opposites, rotation of the upper body by Christoffersen, while Hirscher is strongly counteracting. The lines show the angles of counterbalance and body lean. 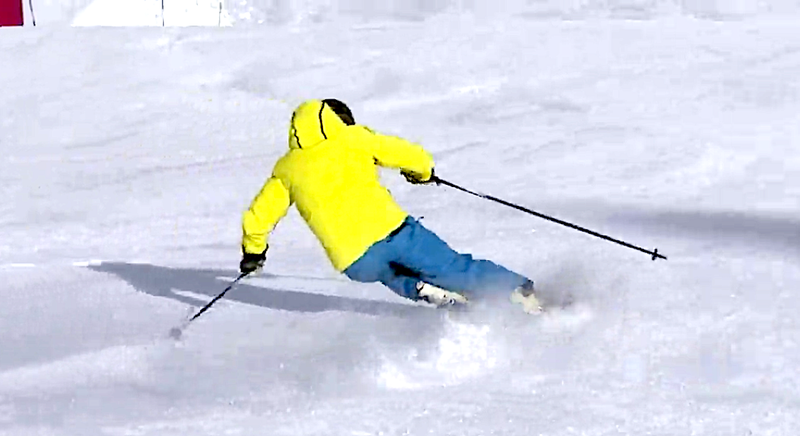 Early Pressure in skiing "The Big Fallacy"! 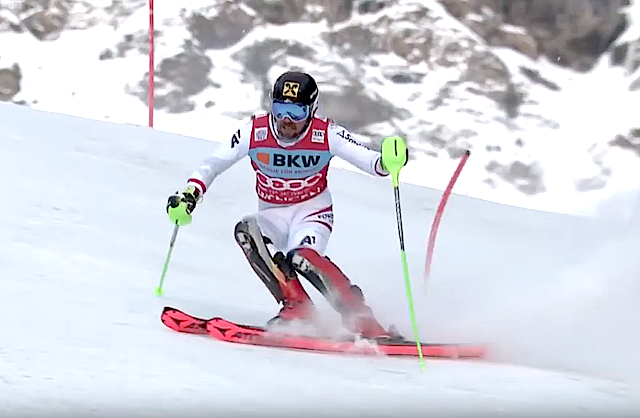 When you watch Universal Sports skiing broadcasts on NBC Sports or the Olympic Channel, Doug Lewis and to some extent Porino, refer to racers as acheiving or not achieving early pressure. They use this to constantly repeat this same message to expalin why some are having trouble or are slow. Lewis's redundant messages on this topic about what raacers are doing and how they do it, is inaccurate. I'm not saying Doug is a bad guy, he's just misguided about ski techique. 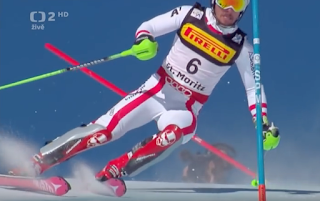 He doesn't totally grasp what is happening with technical skiing. Coaches, parents, USSA and thier racers need to understand what is really happening. Let's have a look at the favorite message presented on the NBC skiing coverage. What needs to happen early in a turn, isn't pressure, it is body, boot and ski angles. 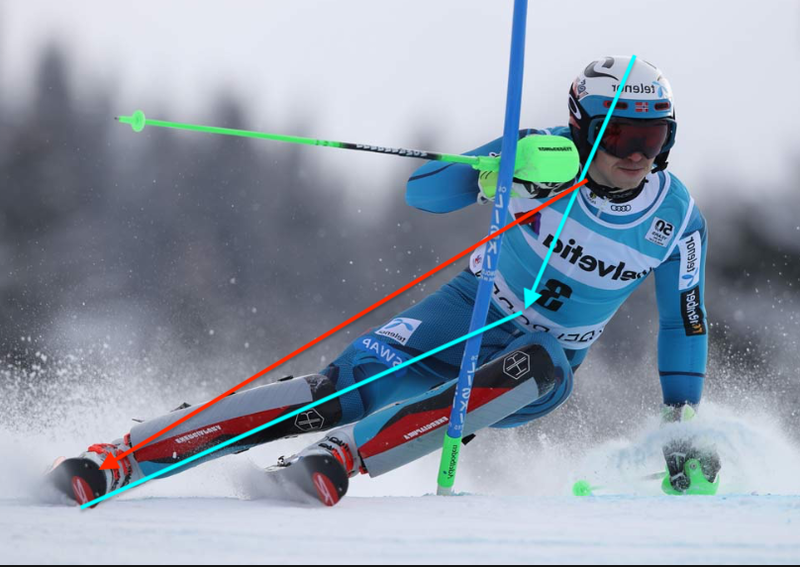 What is happening and what the best skiers in the world are doing in these photos is creating early tipping angles, that is what is needed. Tipping the skis to high angles early, allows pressure to build at the right time. Don't think this is semantics; "early pressure" and "early angles" are totally different and produce totally differnt results. In this photo below, there is no pressure on the skis, but look at the fantastic angles from the best skier in the world. This is above the gate, he is in the falline. 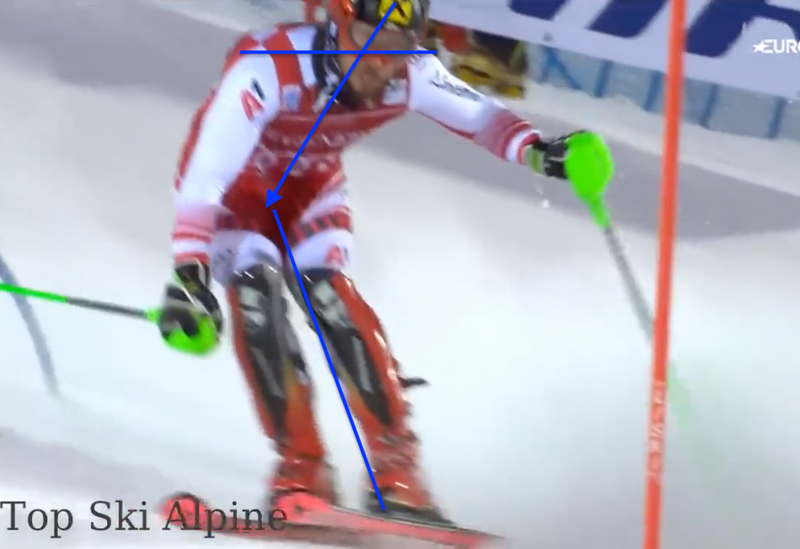 Below is Frame 2-A still no pressure on the outside ski. Frame below, A. 3 Now the ski is engaged, but to get this timing you have to know how to transition using your legs. Fame A. 3 This is where pressure comes back into the body from the skis on edge, from the ski holding against gravity, not from forcing or pushing the leg into the snow to achieve early pressure. Same approach for the left footed arc by Hirscher. In the next 2 photos Hirscher applies the same tactics and technique shown above to his slalom victory in Levi. Notice how the whole upper part of the arc, the first 1/3; he isn't trying to hold or dig the edges into the snow. He is transitioning and creating angles with his skis, body and legs. 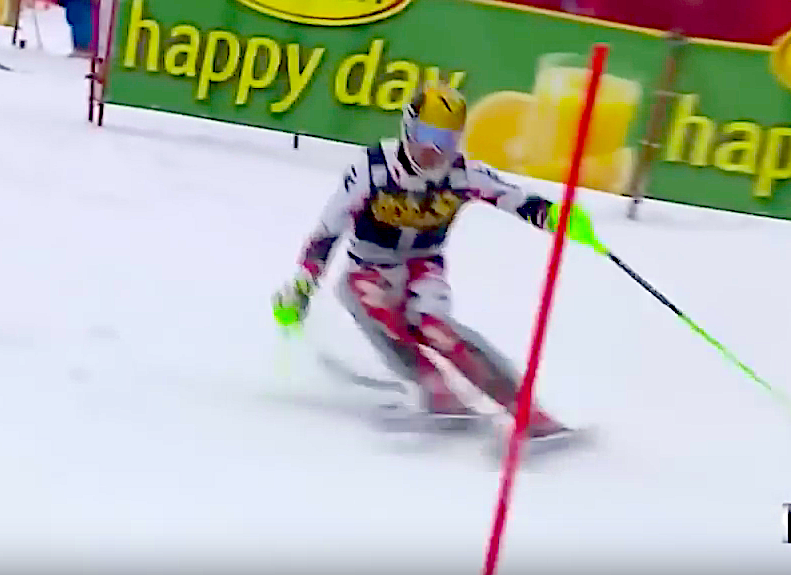 Below: Another example where Hirscher delays pressure and ski engagement until he needs it, not using it above the gate where engagement and pressure lead to a compromised line. In the below photo notice Christopherson trying to pressure the ski above the gate. The early spray from the skis shows less precise ski use. This is slower and less effective. These aren't little details, they determine 1st from 2nd on the World Cup. These movemnts determine if your athletes will move up or bog down. 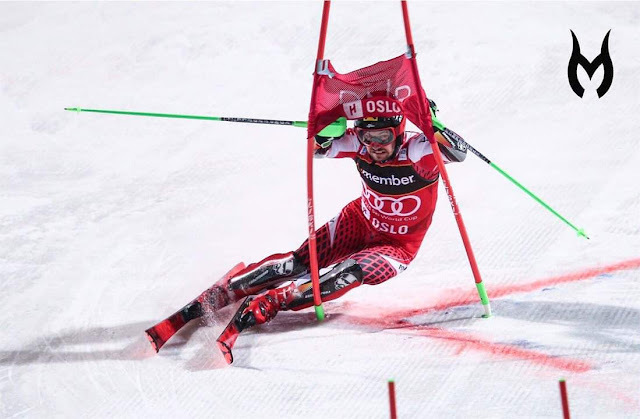 What is demonstrated here by Hirscher are speciific techniques that have to be learned and trained. 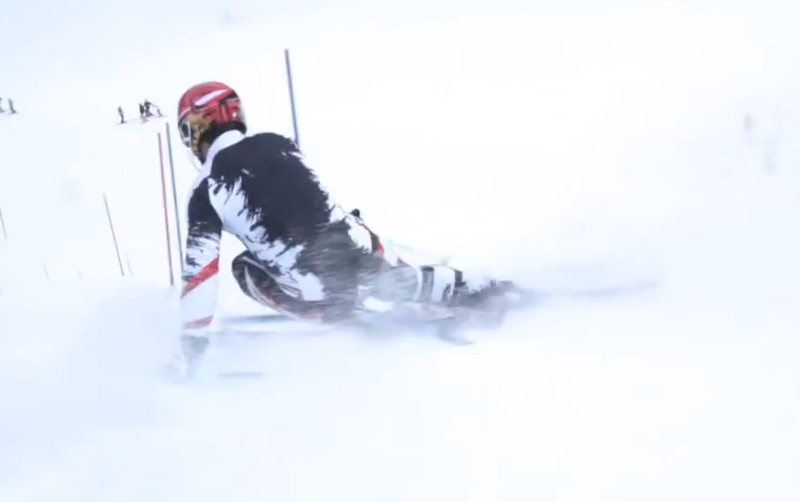 Regular ski coaching won't get racers to this level. The commentators on Universal Sports say many things that are misguided. I know these incorrect messages are going out to our young skiers and coaches. The damage will take forever to reverse, if it can be done. Many will think this is just another attempt to attack, the talking heads. It's not about the talking heads, it's about the future of US skiing, the kids and the efforts put into it by parents. We are moving backward, with this kind of commentary. Case in point, because USSA isn't doing it's job of properly educating coaches, there is no guidence for the commentary. 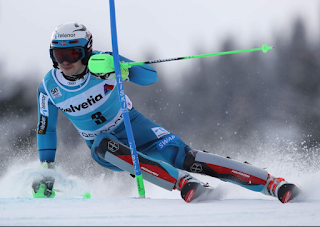 Coaches need training about the facts and biomechanics of ski racing. What we have here is the media spreading skiing to thousands with the wrong message. This broadcasting might seem like entertainment to many, but it is allowing TV commentary to dictate and perpetute misleading skiing information. US skiing is on the wrong road on many different levels and this observer isn't seeing the corrections to the course that are needed. Holding your "Counteracting", what does it mean? Before you can hold your counteracting you have to have achieved it. Sounds simple however it's not often taught correctly or used when needed. At the highest level of skiing counteracting is a given. In ski coaching, it's not and in ski instruction, it's often avoided. Why? It's hard to teach, but not hard to achieve, that's why. Three differnt turns to demonstart Counteracting. In this series of photos, my hips are counteracted as are my shoulders. 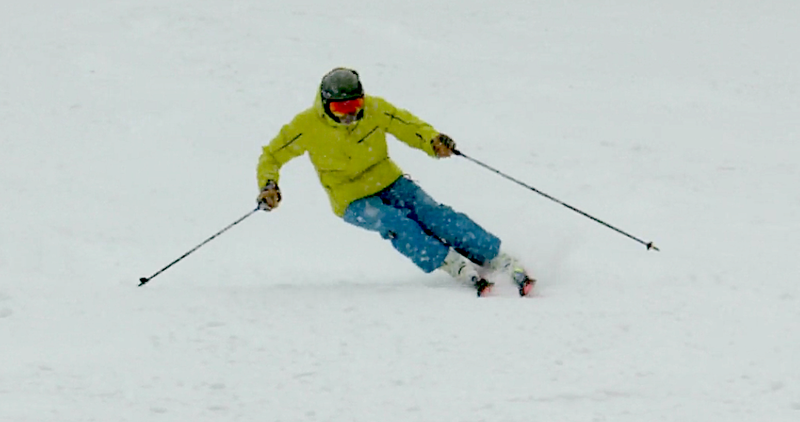 Skiing movements are not easily recognized, so here is an explanation of what to look for. In the photo below my hips and shoulders are facing downhill. In the photos above my hips and shoulders are facing downhill. My skis are still pointed to the side of the slope, just as they are in the photos above. 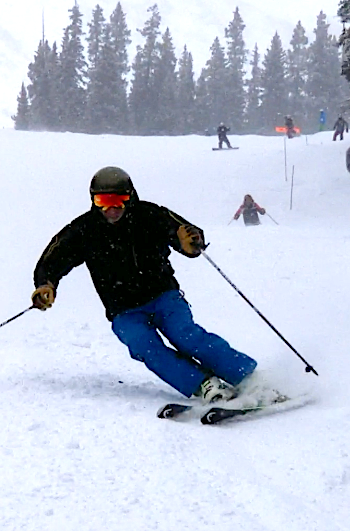 Look at the angle of the skis and where my knees are pointed. The skis have dramatically changed angles the legs have moved dynamically and greatly. The longer outside leg in the upper photos has shorted, and the uphill inside leg has remained bent. This is a "retraction or flexing" release The common term used for holding your counteracting and the movement ability to release the legs is called "upper and lower body separation". Easy to do once you learn it. Hard to teach, hard to find someone who canto demonstrate as well as teach it. At Harb Camps, we teach everyday skiers at all levels. They all learn how to use counteracting like this in there skiing. It has so many benefits that I have to list them in another post. Coming soon to a video near you. There are already many videos on my www.HarbSkiSystems.com website that teach this ability and skill, have a look. So you have to ask yourself is Marcel Hirscher the best skier becasue he counteracts more than anyone else? He has many attributes that make him the best, however CA does stand out compared to his compeitors. Analysis of Boot alignment cannot be done properly without movement understanding. Determining how to evaluate and change bow-legged skiing! Looking at this photo you might think everything is progressing well? However, if you look further at different frames of the same turn it's amazing how everything changes. After you read the whole article come back and compare this photo below to the others in the Yellow jacket. This photo is from last season where my alignment was set to my satisfaction. (below photo) If we look at this frame which is slightly before, higher in the arc, than the one above, you can begin to tell there is something amiss. 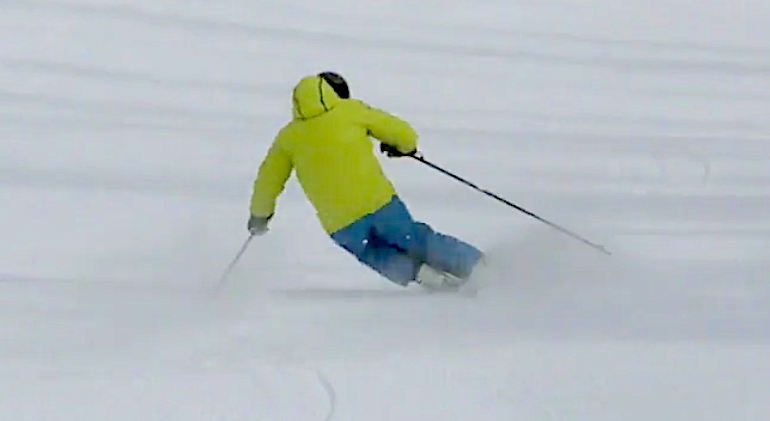 The outside ski isn't rolling over onto the edge, the knee looks bowed out. My hip angle is out of proportion with my lower body angles. (below) This is same turn or arc, but it isn't finished to my satisfaction yet, I'm already bailing out of the turn, too early. "Why?" Again, what is obvious is the knee angle and the space between the knees. Also from a movement standpoint, this release is forced and too early. Now compare this photo, to the one above, whcih was taken only 2 days before. The skis are still arcing, angled and still in the arc, the finish is balanced. Now let's look at the process of identifying alignment in a scientific and measurable way. The photo (above) with the Black Jacket is from 2 days before and with no boot changes. The turn is more rounded at the bottom and still arcing. What is happening here and why are there such differences between the angle and the quality of the arc? Let's dig deeper. 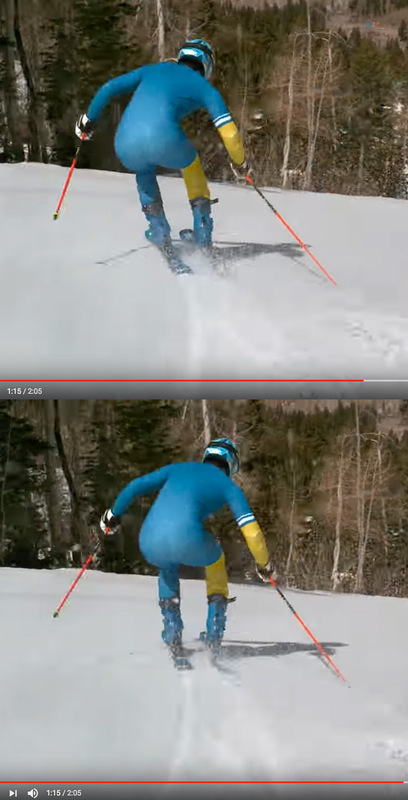 First, these photos demonstrate how alignment affects your skiing. I'll explain how and where these problems originate and how to evaluate them. The only difference or changes from the Black jacket day to the yellow jacket day are the skis. I change clothes when doing these tests to make sure I don't confuse one day to the other. Without real in-depth investigation, most initial analysis can be misleading. 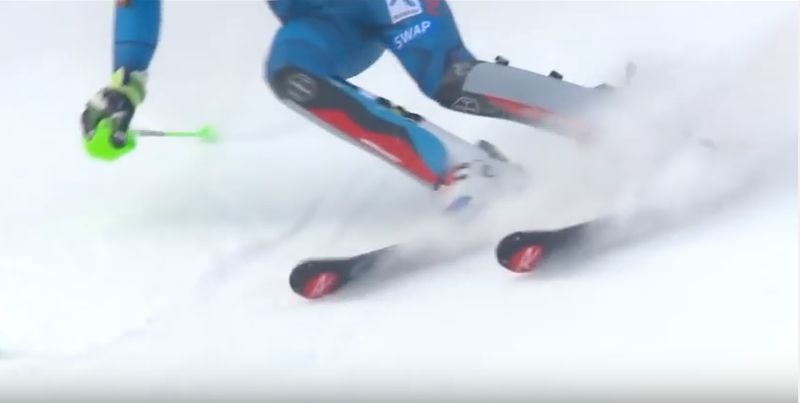 At first look, you could easily think the boot angle is too strong, or the footbed is wrong, the cuff is too close to the leg, or the ski base bevel is too flat? So which is it? It's obvious I know what I want from my skiing and for the turn. This is demonstrated by the first photo at the top of the page. I made the corrections and adapted my body for something under my feet that wasn't right,. Every skier will make adaptive movements to try to correct wrong alignment. 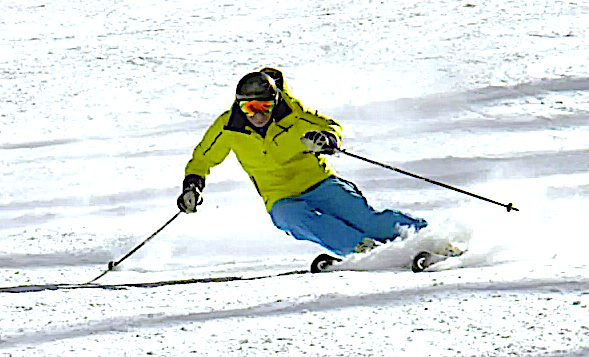 In most cases the skier doesn't know they are adapting because they are so used to do it. Therefore a complete evaluation must be done if reasonable angles and ski performance is to be acquired. If you compare the top of the turn and the bottom it is obvious something isn't right in this case. Some might say, "well you screwed up, you are too far back on your ski, you are not levering or tipping the ski over enough" and so on. Unfortunately while right in this analysis, it's not the cause. There is nothing wrong with addressing what you might say is a bad turn. 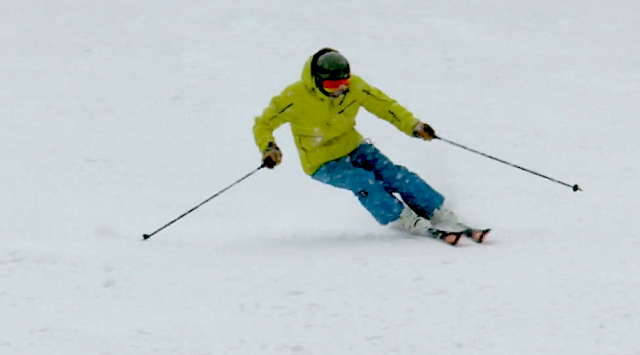 This is done by addressing the movement quality of the skier first. 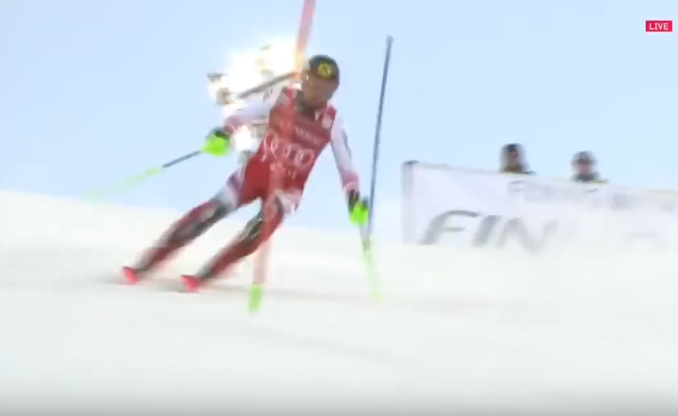 In this case, I can eliminate the movement issues because this isn't my normal skiing. I have the advantage of also knowing that this feels terrible and that it hurts my knee. So how does one narrow down the real issue and correct it? We already eliminated the movement component. Now let's address the boot sole angle or boot canting angle. Indoors this is measured by aligning the knee center to the center of the boot sole at the toe lug of the boot. Since I know this is done and correct based on previous measurements and my boot sole angle wasn't changed; the problem is somewhere else. Sure if you only saw the photos in the yellow jacket it would be reasonable to assume that that boot sole angle was too strong because this type of leg angle is common for skiers with a bow-legged skiing stance. Ok, now we have eliminated the boot sole canting as the major issue. We can move to the cuff angle or cuff position relative to the distance or gap on either side of the lower leg. Too strong or too much pressure from the cuff can keep the shin looking outside or bowed at the top of the arc. However, when the foot, ankle, and leg try to tip the ski, a strong cuff set up will immediately drive the knee under the body in the loaded phase of the arc. This isn't the case here. Too strong a boot cuff determination can be confusing because at the top of the arc (where the ski is relatively unloaded) it appears totally different from the bottom of the turn, where the ski should be bent. Going back to the angles in the black jacket; everything here is right, and no changes were made to the cuff so we can rule out the cuff as the problem. There is one more place in the chain of events that has an influence on alignment and that is the footbed. An over-strong or high arched, rigid footbed can make the knee look outside and bow-legged at the top of the arc. This type of footbed can also make the ski run out or go straight halfway through the arc. So it can't be ruled out, it needs to be investigated. Since I know I don't have a rigid, high arch footbed I can also eliminate that issue. So I've checked all the boxes except one, the ski tune. The lesson here is the interrelationship between the indoor measurements and skiing performance. If you don't have a complete protocol for all the areas of measurement and where alignment of the boot and foot can influence skiing, you will struggle setting up a skier properly. The boot sole, boot cuff, foot and ankle positions in the boot have to be measured and optimized consistent with perfect performance. The process needs to be consistent and measurable or you will be all over the map with your alignment results. On the other side of the equation, the final test and confirmation have to include the on snow skiing tests determining skiing results as I have done here with the photos. Now to what caused the problems for my left-footed turns. Well first you can't judge by one turn. This same problem has to show up on almost every turn in a run if you want to be certain about your evaluation. In this presentation I allowed the least obvious of the alignment influences to take hold so I could demonstrate that you can't leave out anything that might influence your skiing. This particular alignment challenge shown here boils down to skis and ski base preparation. How do I know? I know where all the boot angles stand from the indoor measurements. The only thing that changed between the two days was the skis. I know that the skis I used on the first day where everything was very close to being right for my skiing have a 3-degree base bevel. They have a mild side angle tune. 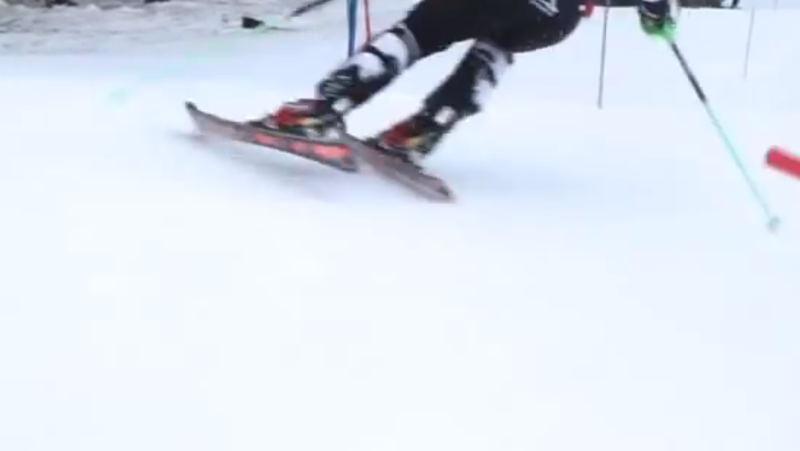 The second day I was on a race slalom ski with a 1/2 degree base bevel with very sharp 3-degree edge angles. The solution, or change to make in this case is, flat file the base, take out some of the side edge sharpness and all will be right. In the end, you have to consider all the places where alignment can influence your skiing. This is what we do at Harb Ski Sytems, where we have established the protocols that work indoors and on snow.